Paris: The Olympia Press, 1949. Limited Edition, #813/3000. Hardcover. Octavos, 2 volumes; VG; bound in green cloth, green labels with dull gilt lettering to spine; mild rubbing and wear; matching limited editions, #813/3000; first edition in English, preceded by the French text; INSCRIBED to William 'Bill' Targ by Henry Miller on the title page of volume 1; name of previous owner on ffep of both volumes; shelved case 2. 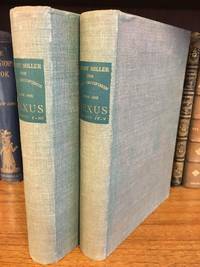 The Rosy Crucifixion, a trilogy consisting of Sexus, Plexus, and Nexus, is a fictionalized account documenting the six-year period of Henry Miller's life in Brooklyn as he falls for his second wife June and struggles to become a writer, leading up to his initial departure for Paris in 1928. [wikipedia]; William Targ (1907-1999) was an American book editor, well respected in the field of commercial publishing. He is known for publishing Mario Puzo's novel The Godfather while editor in chief of G. P. Putnam's Sons. [wikipedia]. Shelved Dupont Bookstore.